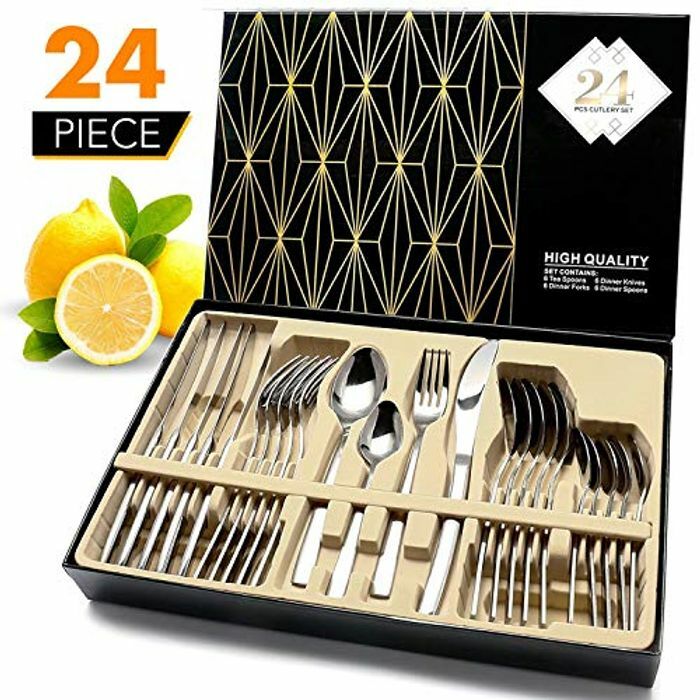 【HIGH QUALITY 24 PCS CUTLERY SETS】Simple and modern design,made of high quality stainless steel with mirror finish polishing,outstanding heat and rust resistance to ensure great longevity,appropriate weight and thickness for maximum comfort. (It is also the first choice of upscale cutlery sets for daily reception of guests. 【MULTI-PURPOSE COMBINATION SERVICE 6 PERSON】6 dinner knives,6 dinner forks,6 dinner spoons and 6 teaspoons are packaged in a nice black gift box, also meet most 6-people family,this cutlery sets fits almost all the décor style on your dinner room ,ideal for kitchen, hotel and restaurant. 【EXTRAORDINARY DETAIL】Smooth to touch handle, fascinating body curve, perfectly rounded spoon bowl, extra careful polishing of all the edges and more that reveal both artistic and safety. 【EASY TO CLEAN】In order to keep it in good condition for longer time, we recommended to wash the dinnerware set by hand. 【PERFECT GIFT CHOICE】This home kitchen cutlery sets is loved by modern American families,it has an elegant modern design,perfect choice of gift for any holiday season such as St-Valentine,Thanks Giving,Wedding,Christmas etc. I bought this set the last time it was on offer. It's alright if anyone is looking to buy it, it does the job for the price! I need a new set. This might be the one. I need a new cutlery set as most of my knives seem to be bent. Probably because I use them as screwdrivers when I can’t find one lol! Good price! Thanks very much for sharing. I may buy it, if it was for £6.99. would make a lovely wedding gift me thinks.